Today during our standard lunch-hour tummy time, Arya decided to show off how easy tummy time has become for her. While resting on just her belly, she reached out with her right hand to grab at a shiny silver thermos. 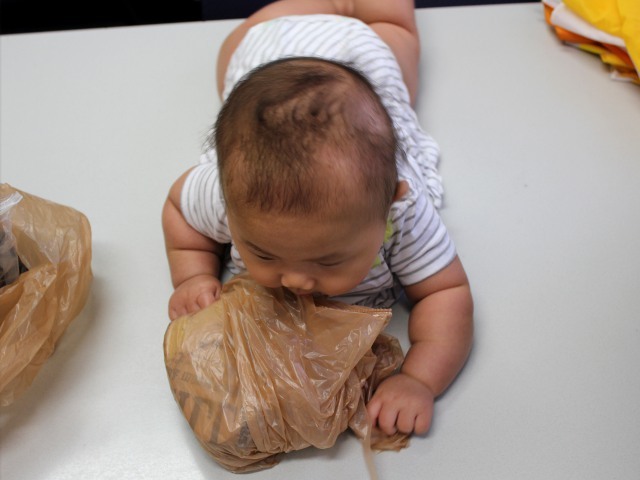 As Mommy moved the thermos away from her, baby used her left hand to grab a plastic bag. While we were being impressed by her coordination, she proceeded to stick the plastic bag–which contained my lunch–into her mouth. It was only after I had taken a picture of her munching on the plastic bag that I realized she might actually be trying to eat the plastic. We stopped Arya from eating plastic and we are both happy that baby enjoys tummy time so much. Since tummy time is critical for baby development. I’m disappointed we weren’t as good at tracking her tummy time development as more organized parents. To make tummy time more fun for Arya as well as her parents, I am considering getting an exercise ball or a tummy time play mat. It’ll be a few more months until Arya is crawling around so we’re going to need to find some way to keep baby interested in tummy time now that it has gotten so easy for her.